I can't believe how often I used to blog and now I'm a total blogging slacker. Two weeks after CIM (sorr, no recap... but I posted a short recap on Instagram! ), I ran the SD Holiday Half Marathon and got a new PR (1:39:26) that was probably the most painful half marathon I have ever run thanks to not being fully recovered from CIM. I was sore for 5 days afterwards. Ouch. At this point, I have about fifteen weeks until Boston and it's time to get back on the wagon. 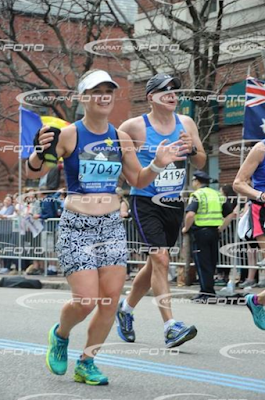 For CIM, I followed my running group (West Coast Road Runners) coach's plan but he hasn't provided me one yet for Boston and, well, if it's going to be something canned/templated/one-size-fits-all, then I can follow Pfitzinger or the BAA plan. If he ever comes back with one, maybe I'll follow it, I don't know. I'm never on the group's schedule since they train for Carlsbad and Rock 'n Roll San Diego. I'm going to start with the BAA plan, with the days shifted a bit since the long runs with WCRR are on Saturday as opposed to Sunday. This week, I tried to squeeze more miles out of a pair of Mizuno Sayonara 3 and that ended up backfiring a bit. In general, the Mizuno shoes I've had have gone at least 250 miles, usually over 300. But these just felt dead at 200. I ran 8 miles on them in that state; the next day ran 8 miles on my Nike Lunar Tempos which I love but only have 8mm heel/toe drop. My shin was pissed after that run and has only started feeling a little better after running the last 3 runs 10-12mm drop shoes. The Lunar Tempos are the last shoe I have in my stash at 8mm and as of this week, I decided they are retiring to casual use only. Did a loop around Mission Bay, it was 55F and sunny, i.e. perfect. Shin was cranky post run. Later in the evening, Elise made me chase after her in circles around the couch. For some reason, after doing this for like 10 minutes or so, the ball of my right foot got painful under the 4th toe. Really bizarre. I iced it. Next morning, it was still sore. Sunny and warm! 75F. I threw some green Superfeet insoles into my Adidas Boost Glide 8 and they felt good! I am digging Adidas. I bet I'd love the Adidas Ultra Boost but the price is insane ($180) and they aren't actually that easy to find. Decided to run my neighborhood again because the rain was coming and in case I got caught in a total downpour, I'd be close to home. Managed to only catch some at the end of my run. Still my shin is not thrilled. I ran in my Mizuno Wave Riders, IDK is my legs are needing more cushion right now and the Wave Riders are too firm. Ran with the WCRR crew and, I don't know, I really like the group but I find that people run their long runs too fast? Not everyone, but the majority of the people in the pace group I run with are running their long runs faster than me, and their marathon performances are a good bit worse. My heart rate was higher than I would have liked but this is what happens when you get pulled along with the group at a faster pace than you would have liked. Though, I will say that the BAA marathon plan does have some marathon pace miles thrown into long runs so I think, in general, my long runs will have heart rates that are a little more elevated. Went down to Mission Bay for an easy-ish 5 miles. Apparently there was either an early morning New Years party or one that was still going from the night before. But it was really bizarre to run by loud party music and people in costume at 8am. CWX compression capris and test run with Under Armour Drift! What I learned this week, the mostly hard way, is that I can't do low drop shoes. And by low I mean under 10mm. I just can't. After a week of running in regular drop shoes, my shin is approaching normal again. Thank God that the trendy thing of barefoot/low drop shoes has swung back. I was getting concerned that shoe companies were going to shift everything to like 6-8mm. Which, really, Saucony and New Balance have kind of done that. Which is why I have none of their shoes. Anyway, after this first week, I'm going to start doing some tempo/speed stuff. I'm feeling pretty recovered from everything, including the shoe debacle so I think I'm ready! Hey, there. I stumbled across this blog from your other one on Boston cutoff times. I qualified for Boston 2016 and ran it, somewhat disastrously, after training with the same group (WCRR). How many from the group are running Boston this year? I've been out and haven't raced since Boston 2016, but I'm interested in how the group is doing this year.